Combine all ingredients with ice and shake well. Pour over an ice cube and spray drink with the oils from a slice of orange peel. I wrapped the orange peel around candied ginger, but I’m sure garnishing with just the orange peel would be just fine. NOTES: I’m surprised how much I actually liked this one. 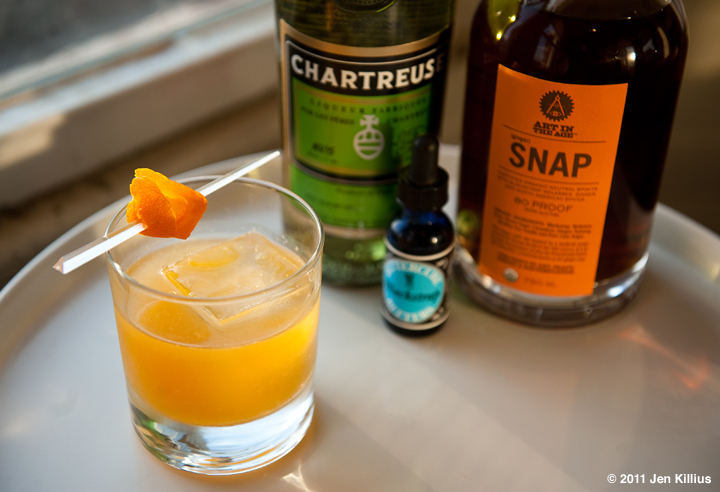 Before now, I was struggling to really enjoy SNAP as I did with ROOT because it was just too sweet on its own, but the Chartreuse really helped to level it out, and bring just a hint of that side-of-the-tongue tingle that I always get from Chartreuse. The orange juice being actually fresh squeezed is imperative, too. Not even just that organic fancy orange juice, because it’s just too thick and soupy. Squeezing it straight out of an orange into the measuring cup leaves you with a nice thin, orange-without-being-too-orangy juice much closer to lemon juice than what you buy at the supermarket. Overall, this was a really nice drink. Refreshing, but boozy enough to still have a good kick. Might use 0.75 oz orange juice next time just to make sure I’m not losing any of the flavor behind the citrus.